BMW of North America has issued two recalls covering about one million vehicles that contain parts implicated in car fires. The recalls span six years of production and include numerous models of the luxury vehicles, but one of the recalls involves a valve heater that can cause fires in vehicles that are not in operation, reminiscent of some of the mystery fires that were the subject of an ABC News investigation that aired on Good Morning America, World News Tonight with David Muir and Nightline in May. The investigation — launched in collaboration with ABC-owned stations in New York, Los Angeles, Chicago, San Francisco and Raleigh, N.C. — found more than 40 cases in the last five years in which BMW owners said that parked cars that were not then subject to recalls for fire-related issues spontaneously burst into flames. Some of them, they said, had been turned off for hours or even days. Using the NHTSA recall database, ABC News found that 12 of those vehicles identified in the ABC News investigation were subject to one or both of the new recalls. In a written statement sent to ABC News on Friday, a BMW spokesman acknowledged the voluntary recall. Bill Macko lost his car and his home when his 2008 BMW X5 ignited in his garage. One recall involves the heater for the positive crankcase ventilation (PCV) valve, and the other recall involves wiring and electrical connectors in the system that controls air flow for heating and air conditioning. Both NHTSA safety recall reports can be read below. The PCV valve heater recall affects 740,561 BMW vehicles from these models and years: 128i from 2008 through 2011; and the 328i, 525i, 528i, 530i, X3. X5 and Z4 from 2007 through 2011. The blower motor system connectors recall affects 672,775 vehicles of these models and years: 323i, 325i, 325xi, 328i, 328xi, 330i, 330xi, 335i, 335xi and M3 from 2006 through 2011; 335is from 2007 through 2011; and the 335d from 2009 through 2011. Some of the 3-series models are listed in both recalls, bringing the total number of vehicles affected to about 1 million. Dealers will fix the vehicles for free, with an expected start date of Dec. 18. BMW owners can easily determine if their vehicle is covered by the two recalls by going to NHTSA’S website and using their Vehicle Identification Number (VIN) to check for open alerts. 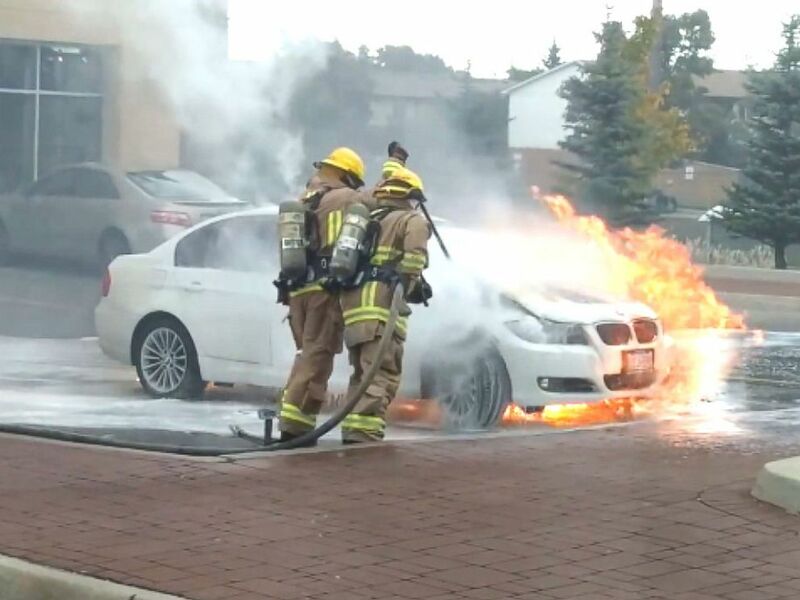 Taz Zaide said that his 2011 BMW 3-series caught on fire about five minutes after he had parked his car to go to work. Joseph Santoli, a New Jersey-based attorney who has sued BMW in the past, called the new recalls a “step in the right direction” but says the mystery of the parked BMW fires is far from solved. 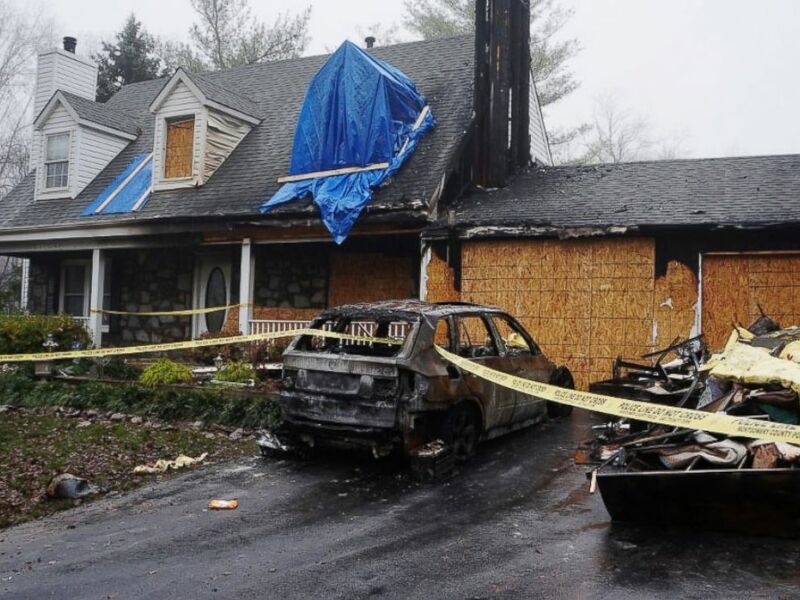 In some cases, the vehicles have been so badly burned it was difficult to determine a cause, and in other cases, the fires were determined to have started elsewhere on the vehicle, Santoli said. “I really think that they have to do a comprehensive study of what is causing all of these fires and they have to work much more closely with NHTSA,” Santoli said of the car company. He added that in some cases, consumers have been asked to sign blanket confidentiality agreements. “That just compounds and exacerbates the problem,” he said. Last spring, ABC News turned over its findings to the National Highway Traffic Safety Administration, which issued a statement asking consumers to report any potential safety issues. 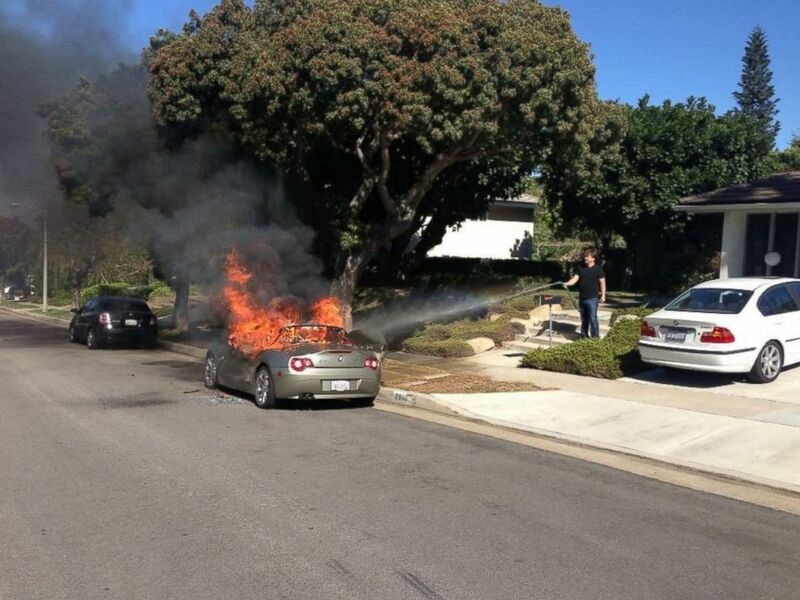 Brandie Macias told KABC-TV that her 2005 BMW Z4 spontaneously caught fire in the middle of the afternoon while it was parked on the side of the street. According to chronology reports provided by BMW to NHTSA, BMW had looked into heat damage involving the heating and cooling system as early as 2007 but stepped up its analysis work in September. The issue with the valve heater first came to the carmaker’s attention in 2009 and tests were performed in 2011 and 2012. The carmaker met with NHTSA in October and issued the recalls. Since the ABC News investigation aired in May, numerous other consumers have contacted ABC News with their own stories of parked BMW vehicles spontaneously catching fire. Auto safety expert Sean Kane, founder and president of Safety Research & Strategies, said the new recalls’ focus seems narrow considering all of the fires that have been reported and the range of issues that could be responsible. Modern luxury cars have become so complex, Kane said, that it’s hard to pinpoint issues that arise.